A billboards_base material creates coverings for multiple Billboards. Deferred - all lights are rendered deferred. Auxiliary - enable additional auxiliary texture. Indicates that all lights influencing billboards will be computed by means of deferred shading. If disabled, forward shading will be used instead. Forward shading allows making billboards semi-transparent. Auxiliary pass is used for writing the contour of object with the specified material into an auxiliary color buffer. Lock X Axis - lock a billboard along the X axis. Lock Z Axis - lock a billboard along the Z axis. Screen Aligned - set billboards parallel to each other. Angular Size - set billboards to always be of the same size regardless to the camera position. Emission - enables an additional emission texture providing the emission effect. Emission Texture - allows to select the texture to be used for the emission effect. Angle Visibility - set limits for horizontal and vertical visibility angles. Geometry Inflation - limit minimum billboard screen size (in pixels) to a fixed value in order to provide visibility from far distances. Locks billboards orientation along the X axis (by default billboards always face the camera). Locks billboards orientation along the Z axis (by default billboards always face the camera). Billboards can be also locked along both X and Z axes, so they will be oriented perpendicularly to Y axis. Sets billboards to always be of the same size regardless to the camera position. The Emission option enables an additional emission texture providing the emission effect. The textures available for billboards are listed below. 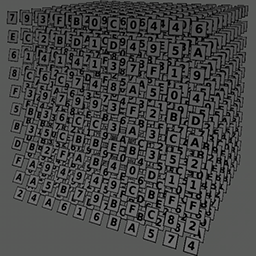 An alpha (A) value provides detail texture modulation and stores transparency values. 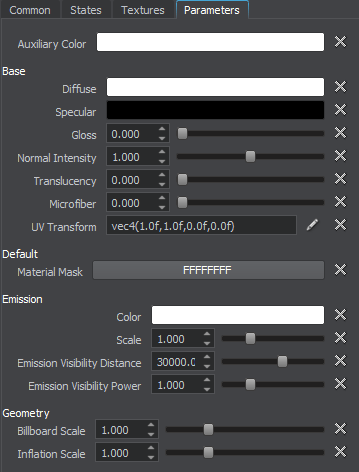 An alpha (A) value will store transparency values if an Alpha test blending preset is enabled. Otherwise it will store a detail mask. Specular map. A texture to define a surface's shininess and highlight color. The above textures with the _d, _n and _s postfixes in the name respectively, located in a folder named uncompressed, will be automatically compressed by the engine. Auxiliary - a texture for the auxiliary pass. Emission map. 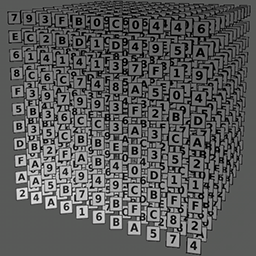 A texture to store information about the light emission. 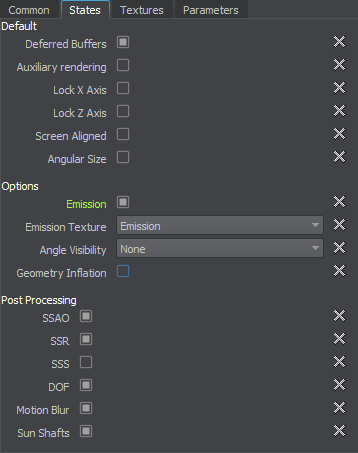 Additional emission texture is present only if an Emission option is enabled and is modified in the Additional field of the Textures tab. RGB values store a glowing color. An alpha (A) value stores a glow mask: black is for non-glowing areas, white - for glowing ones. Auxiliary texture is used to render it in auxiliary buffer. A color picker to choose the color of the specular map. Normal is a coefficient to scale the intensity of the normals (provided by a normal map). The higher the value, the higher the normal texture effect is. Scale of the translucency effect, which permits light to pass through the object, but diffuses it so objects on the opposite side are not clearly visible. Coefficient to scale the intensity of the microfiber effect. The higher the value, the more pronounced the microfiber effect is. 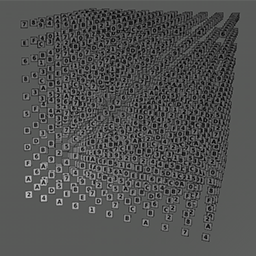 Scale texture coordinates, along X and Y axes. 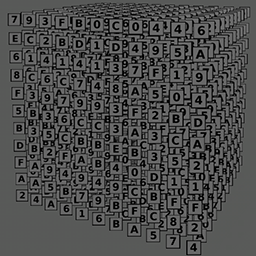 For example, by the scale of 2;2 the texture will be repeated four times on the surface. For example, by the offset of 0.5 along X axis the texture will be repositioned to the right (so the left edge of the texture will be rendered in the center). Auxiliary color parameter is present only if an Auxiliary pass is set as a Default. The parameter is modified in the Auxiliary field of the Parameters tab. Emission parameters are present only if an Emission option is enabled and are modified in the Emission group of the Parameters tab. A color picker to choose an ambient emission color for the emission texture. 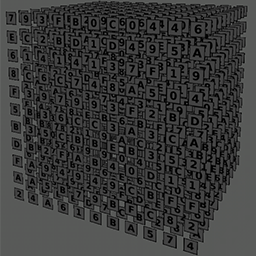 Visibility scale for the emission texture. The higher the value, the more visible emission texture is: light areas will be lighter and brighter. Distance from the camera up to which the emission from the billboard will be visible, in units. 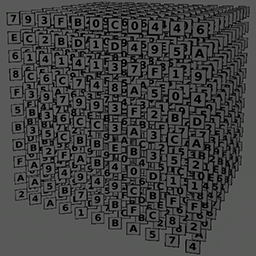 Power multiplier to scale distant dependent visibility of the emission texture. It determines the way the intensity of the emission effect changes depending on the distance from the camera. Geometry parameters are present only if Geometry Inflation option is enabled and are modified in the Geometry group of the Parameters tab. Minimum permissible size for the billboard, in pixels. Geometry parameters are present only if a corresponding item of the Angle Visibility option is selected and are modified in the Visibility group of the Parameters tab. Angle limit in the XY plane relative to the -Y direction, in degrees. The billboard will be visible within the [-value; value] range of angles. Angle limit relative to the Z axis, in degrees. The billboard will be visible within the [-value; value] range of angles..